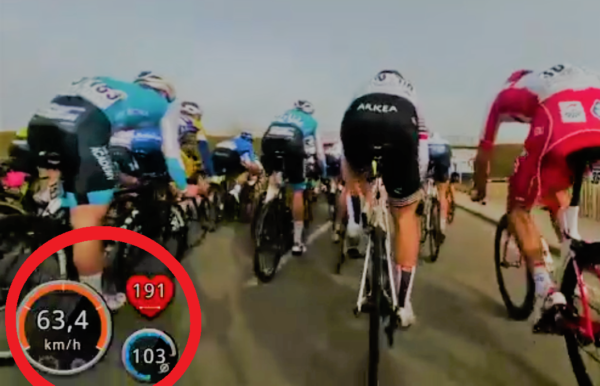 The movement in the bunch and the rider’s real time data makes this a fantastic clip. It really captures the intensity and chaos of a peloton of cyclists vying for position as the finish line approaches. Team Colpack has posted this clip recorded inside the peloton as the stage finish at Etoile de Bessèges approached today. It ended in a bunch gallop, with Christophe Laporte (Cofidis) winning from Clément Venturini (AG2R La Mondiale). This clip captures how intense and chaotic the movement in the peloton can be, with no margin for error. And the fact the rider recording was linked up to real-time data really brings home how fast and pressurised the finish was. The speed hits over 60km per hour, for sustained periods, and the rider’s heart rate is north of 190 beats per minute at times. This is well worth a watch; not for the feint hearted.